Cue the Beatle's "Mr. Moonlight". My Fave Aloe. Just a spectacular bloomer and better by the year. That is stunning Stan it would be my favourite too. Are you drowning with all the rain, yet? We've had a lot of rain and are expecting a crazy amount of rain over the next week. Some models are forecasting 6 - 9 inches of rain. That's nuts! We need it, though. Its been lots of rain..but not "rivers" worth. Most of the deluge is from SF north. The problem is the gray skies and wet. That's when rot can set in. I know more rain is coming to California. The Rivers are flooding here right now. We're getting a very big Valentine's Day storm. I noticed that Los Angeles wont have a single 70f this month. Unusual for them. It's all low to mid 60's. That's our usual February and of course we are getting driven down to the 50's mostly. Good thing I put the Crotons on the porch..all the constant wet would have rotted the roots by now. Some floods. But that's natural this time of year in any normal rainy season. We are only around average in rainfall overall. Its just after the 4 year drought,we got used to sunny 70 or even 80f days (30c) days in February Lori. Todays paper says long range is none of that this year. Feb-April is supposed to stay wet and cool. Thats what the 1960's were like as a kid. ONLY..it was wet and colder winters with small puddles iced over on the way to school in winter. The urban growth- at least- has ended that. 7 million people crowd the shores of the bay. Andy,Lori..the paper had an article that says by 2060,soucal will be just as warm as Cabo in winter. The bay area,Los Angeles is now. Not that far away to get results now. Like Coconuts in Del Mar and Crotons on porches in Hayward..ha. ps..I know I had read a couple of years ago it was supposed to be 2100 A.D. when that happens. They lopped off 40 years and accelerating.. It was half that when I was born. Eisenhower was also President. not really that long ago, then? early fifties? We're the baby-boom generation. I'm a couple years older. world population seemed to accellerate during the last half of the 20th century...and I can't believe that we are on the cusp of the second decade of the 21st. Do you remember reading the predictions of Y2K? storms, fires, floods, polar shifts? looks like we're there. 1958! More hair wants to grow on my ears or nose than head..lol. Grooming changes as I age.. There is something in the air..its been cold and windy for here..but you read Polar bears in Oregon or something and you know things are changing even more beyond what you can see locally. Actually Lori I have seen big changes since a kid. Hayward was 9b. It moved to 10a in 2012. This year was a 10b. That might be more often. Just wait to some asteroid hits. ! Wow! A lot has happened since my last time on GoY. lol! I just got back from the SF Bay Area. I can't believe the amount of large Ficus banjamina trees (some easily more than 20' tall) and King palms I see everywhere, especially in San Jose where I was staying. There was snow the whole time I was there on Mt. Hamilton. It was Cold at night 30's and low 40's, upper 50's low 60's during the day, wasn't too bad. Yes, the warming of the climate continues, even though it's been pretty cool and rainy this winter in San Diego. Actually, lots of rain, which we need so badly. It's very, very green here. It's so beautiful! I thought I had posted this already...but Andy Mission Peak had snow..in the middle of the day. I heard Mission Peak had snow. It usually snows on Mission Peak once every 7 years or so, right? There was snow down to 2,500 ft here last week in the foothills. Rained all Friday night..more rains are lined up right to NEXT weekend. Along with cool temps for March. We should be averaging mid 60's by now and could count on a 70+ here and there. But,Aloe's,Crassula,Kalanchoe,Lampranthus all in bloom now. Wear a rain jacket is all. It's been cooler than normal here in San Diego, also. More rain is heading here, also. We are already above our annual rain fall. It's good for the severe drought. The hot weather will be here soon. NWS has Hayward at 8" of rain this season. SJ is 12 and Oakland 14"..so I don't get it. Cant be right. Raining right now in midday Wednesday. One factoid Andy? We might be only around 100% of rains, it's been spread over twice as many rainy days. So,a real lack of sun here in the bay area. 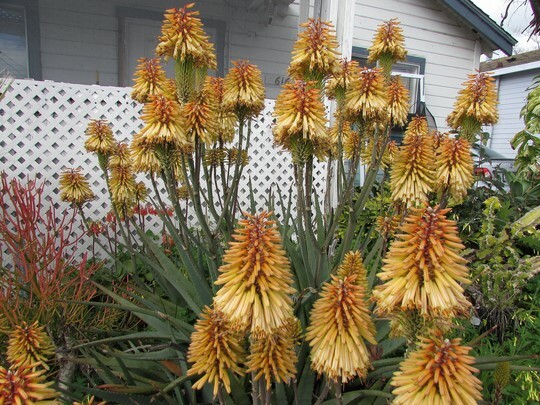 This photo is of species Aloe. See who else has plants in genus Aloe.